We are Supplier & Exporter of Nickel Alloy 200 Pipe Flanges, Nickel 200 Slip on Flanges, Nickel 200 DIN Blind Flanges, Nickel Alloy UNS N02200 Plates Flanges Manufacturer in India. We are an internationally renowned manufacturer and exporter of superior quality nickel alloy 200 flanges, which are popular amidst the clients for durability and trouble free continuous performance. 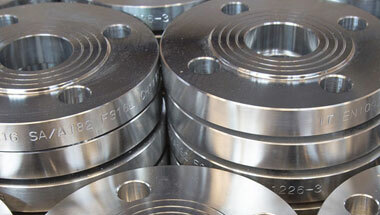 These nickel alloy 200 flanges are designed with precision for easy installation. Apart from standard flanges, we also offer custom designed nickel 200 flanges to meet the specific application requirements of the customers. Nickel alloy is versatile, highly corrosion resistant element that will alloy with most metals. Due to its corrosion resistance, Nickel Alloys are used to maintain product purity in the processing of foods and synthetic fibers. In addition, nickel has good thermal, electrical and magnetostrictive properties. Relatively high thermal conductivity of this metal has lead to its frequent use for heat exchangers. Nickel alloy 200 flanges are available in different types such as Socket Weld, Slip On, Blind, Lapped, Screwed, Weld Neck, Long Weld Neck, Reducing, Spectacle, Ring Joint etc. ASTM A564 Nickel 200 Flanges, Nickel 200 Orifice Flanges, Nickel WNR 2.4066 Forged Flanges, Nickel 200 Socket weld Flanges, Nickel 200 ANSI/ASME B16.5 Reducing Flanges Supplier in India. Australia, Kazakhstan, Egypt, Thailand (Bangkok), Morocco, Nigeria, Saudi Arabia, Trinidad and Tobago, Angola, Colombia, Cameroon, Azerbaijan, Africa, Canada, Democratic Republic of the Congo, Ghana, Ethiopa, Houston, Sri Lanka, Chine, Indonesia, Turkey, Dubai, Kuwait, Tunisia, London, United States, Sudan, Mexico, Italy, Germany, Venezuela, Bahrain, UAE, Uganda, Peru, Mozambique, UK, Russia, Malaysia, New Zealand, Argentina, Iran, Iraq, Algeria, Brazil, Jordan, Vietnam, South Africa, Israel. Johannesburg, Colombo, Khartoum, Accra, Yaoundé, Freetown, Istanbul, Conakry, Maputo, Sharm el-Sheikh, Byblos, Pretoria, Durban, Alexandria, Rabat, Douala, Addis Ababa, Tripoli, Port Elizabeth, Amman, Bulawayo, Manama, Hong Kong, Casablanca, Abu Dhabi, Aqaba, Lubumbashi, Kano, Kinshasa, New York, Port Harcourt, Abidjan, Dammam, Soweto, Dar es Salaam, Lagos, Mbuji-Mayi, Antananarivo, Giza, Muscat, Algiers, Cairo, Maiduguri, Bethlehem, Brazzaville, Mogadishu, Harare, Ibadan, Cairo, Bamako, Beirut, Zaria, Kampala, Jeddah, Subra al-Haymah, Mecca, Kolwezi, Dakar, Tehran, Dubai, Ouagadougou, Nairobi, Singapore, Lusaka, Doha, Riyadh, Data from the UN, Cape Town, Tel Aviv, Luanda, Jerusalem, Fez, Kaduna, Omdurman, Benin.